diabetessightrisk.com at WI. Living with a Retinal Disease and Blurred Vision? Living with a Retinal Disease and Blurred Vision? 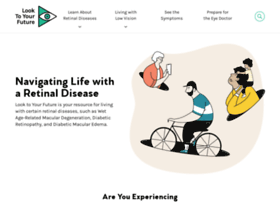 Find resources for living with low vision caused by retinal disease, including Diabetic Macular Edema and Wet Age-related Macular Degeneration.